I'm pleased to announce that, some hours ago, the first public beta of cross-browser NoScript (10.6.1) passed Google's review process and has been published on the chrome web store. This is a major milestone in NoScript history, started on May the 13th 2005 (next year we will celenbrate our 15th birthday!). one full, long and quite dramatic rewrite, to migrate it to the WebExtensions API (in whose design and implementation Mozilla involved me as a contributor, in order to make this possible). 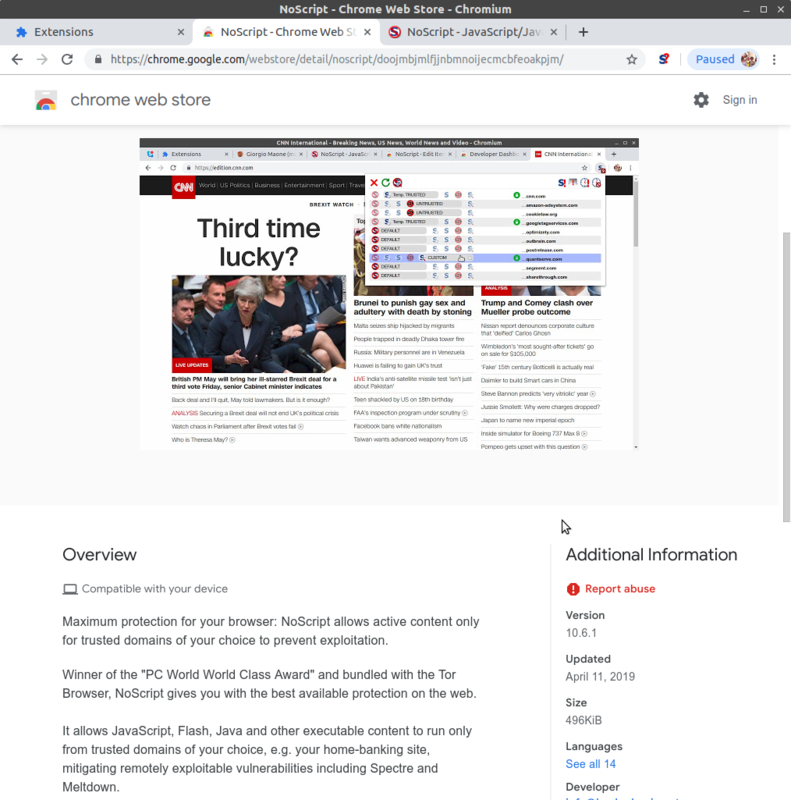 And finally today we've got an unified code-base compatible both with Firefox and Chromium, and in possibly in future with other browsers supporting the WebExtensions API to a sufficient extent. 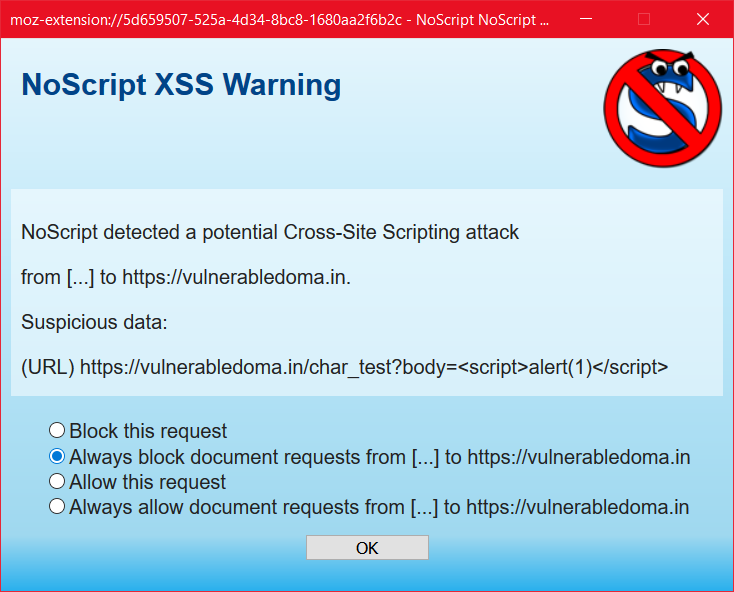 One difference Chromium users need to be aware of: on their browser NoScript's XSS filter is currently disabled: at least for the time being they'll have to rely on the browser's built-in "XSS Auditor", which unfortunately over time proved not to be as effective as NoScript's "Injection Checker". The latter could not be ported yet, though, because it requires asynchronous processing of web requests: one of the several capabilities provided to extensions by Firefox only. To be honest, during the "big switch" to the WebExtensions API, which was largely inspired by Chrome, Mozilla involved me in its design and implementation with the explicit goal to ensure that it supported NoScript's use cases as much as possible. Regrettably, the additions and enhancements which resulted from this work have not picked up by Google. Let me repeat: this is a beta, and I urge early adopters to report issues in the "Support" section of the NoScript Forum, and more development-oriented ones to file technical bug reports and/or contribute patches at the official source code repository. 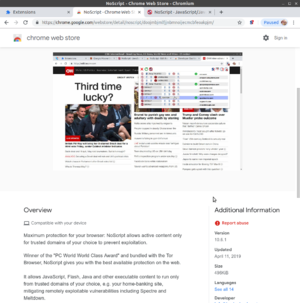 With your help as beta testers, I plan to bless NoScript 11 as a "stable Chromium-compatible release" by the end of June. I couldn't thank enough the awesome Open Technology Fund folks or the huge support they gave to this project, and to NoScript in general. I'm really excited at the idea that, under the same umbrella, next week Simply Secure will start working on improving NoScript's usability and accessibility. At the same time, integration with the Tor Browser is getting smoother and smoother. See also ZDNet's and GHacks' coverage of the announcement. NoScript 10.1.6 reimplements the "Export" button functionality in a more convoluted way, which doesn't require the "downloads" permissions anymore though :) Enjoy! It seems some users are really upset with NoScript 10.1.5.7 asking for an additional "downloads" permission. This surprised me a bit. Not just because NoScript 5, which everyone loves to praise in order to bash 10, was all-mighty: like any other "legacy" add-on, it could even format your hard-disk, not before having sent all its content to a remote server in Siberia. But especially because they already granted NoScript 10 itself (like all the other content-blocking WebExtensions, including all the popular adblockers) plenty of much scarier permissions, such as the ability of monitoring and filtering all your network traffic, which I find the scariest of all but, quite obviously, is mandatory for the task you use NoScript for. Unfortunately the WebExtensions permissions asking prompts don't let authors to explain in advance what a certain permission is used for (yet I did provide this info in the support forum since first release), but for those who couldn't figure it out from the changelog: the "downloads" permission just gives access to the downloads WebExtensions API, which NoScript uses to implement the "Export" feature and let you save a configuration file somewhere on your disk. Because, unlike "legacy" add-ons, WebExtensions cannot interact with your filesystem directly and so must make you "download" the file. Notice also that instead, just like "legacy" add-ons, and unlike Chrome extensions AFAIK, Firefox WebExtensions are still reviewed at AMO by a trusted staff of experienced add-ons developers, whose job is much easier now because of the simplicity of the new API and, guess what?, because of the explicit permissions: the first thing they do with a new version is looking at the code differences and checking that those permissions are used in a legitimate way. Rob Wu, the reviewer which filtered 10.1.5.7 even suggested alternate ways to implement the Export functionality without the new permission, but we tried those and they just didn't work. Someone seems to be still convinced that changing our beloved NoScript UI has been a whimsical (and suicidal) decision of mine, entirely avoidable. The ones who know better about recent history of Firefox and of its add-ons ecosystem are aware, though, that the UI couldn't stay the same simply because the technical foundation (XUL/XPCOM) for the "old" one is not there anymore, and NoScript has been forced into being completely rewritten as a WebExtension (and therefore its UI as pure HTML) or just die. Since it was anyway impossible to replicate exactly the well known user experience provided by NoScript 5.x (which, BTW, is still actively maintained and available here), I've tried to find a silver lining in the forced rewrite, taking it as a chance to incorporate user feedback collected over more than 12 years, especially about making the permissions system more customizable. And indeed, the old concepts are all still there, but the way they are implemented is more flexible and amenable to customization, albeit admittedly less discoverable and, for long time users, surely confusing at least initially. Back to presets, DEFAULT is the set of permissions that any unknown site has. So if you don't touch NoScript, beside a handful of websites (the "old" default whitelist) pre-assigned with the TRUSTED preset, all the sites on the Web have the permissions of the DEFAULT preset (i.e. almost none). 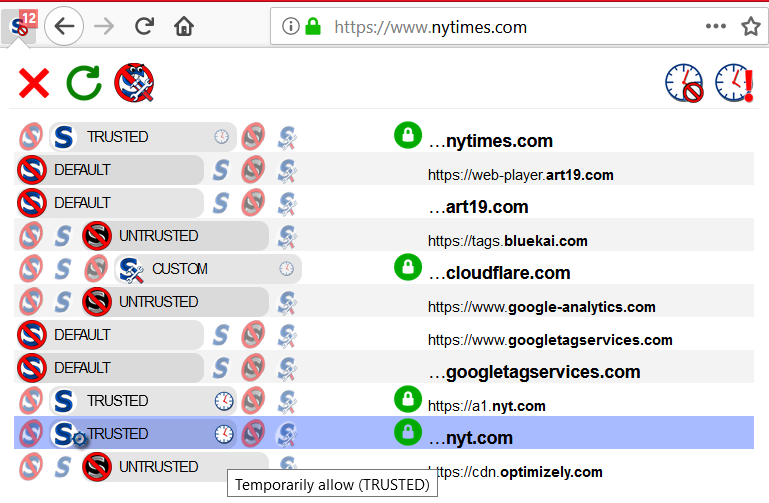 "Temporary allow xyz.com" maps to clicking the TRUSTED preset on the xyz.com row. "Forbid xyz.com" maps to clicking the DEFAULT preset, which actually means deleting the site from the internal "whitelist". In facts, if you do it in the general Options panel, next time you open the panel (or refresh it) the site is not even listed there anymore. It doesn't disappear right away for convenience, to give you the chance to change your mind or correct mistakes. "Mark xyz.com as untrusted" maps to clicking the UNTRUSTED preset, which contains no permission at all and is meant to collect and remember the "known bad sites" in a permanent blacklist. And then CUSTOM, which is new to NoScript 10 and lets you fine tune just a certain website with its own specific permissions, either more restrictive than DEFAULT or more permissive than TRUSTED ; this tuning is either permanent (by default, the clock shaped icon in this case comes disabled) or temporary, by additionally clicking the clock-shaped icon. Each and all the presets can be freely customized to your own needs, with the convenience constraint that you cannot remove the "script" permission from TRUSTED, and you cannot add it to UNTRUSTED. However, the factory presets are very similar to the "old" NoScript experience. What about the "Match HTTPS only" green/red lock toggle? If green (locked), the toggle makes base domain entries (e.g. "..google.com") match themselves and all their subdomains, but only if their protocol is HTTPS (and therefore the traffic encrypted and not easily tampered with). Otherwise, if red and unlocked, both HTTP and HTTPS match: this has bad security implications especially on "hostile" networks where injecting malicious scripts directly in the unencrypted traffic is relatively easy, but is unfortunately needed for some sites to work. NoScript tries to gives you the "smartest" default for each site, i.e. green if the page is already served on HTTPS, red otherwise. A lot more needs to be written yet, but these are the bare bones. If you find bugs or need support, rather than using in the blog comments or, even worse, the AMO review system as a way to communicate with developers, please submit to the support forum here. And if you want to help me with development, please install latest development build, which is released even more often than the stable and ships earlier both bug fixes and new features. And please keep providing feedback, as especially the UI is still a work in progress and I'm eager to make it better than before, by merging as much as possible of your valuable contributions.